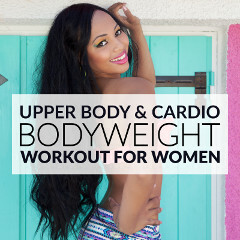 Boost your metabolism to the max with this upper body and cardio split workout. Bump up your post-exercise oxygen consumption and become a calorie-burning machine! Start this split workout with an upper body warm up routine. 1. Dumbbell side swings: 60 seconds. Stand straight and hold a set of dumbbells in front of your thighs. Pull the left dumbbell toward the chest and raise the right dumbbell out to the side. Lower the dumbbells, reverse the arms and repeat. 2. Tricep dips: 60 seconds. Place your hands behind you onto a bench, extend your legs and start bending your elbows. Lower yourself until your arms are at a 90-degree angle and then come back up. 3. Concentration curls: 30 seconds + 30 seconds. Sit down on the bench holding a dumbbell in your left hand. Squeeze the left biceps and bring the dumbbell toward your chest. Repeat for 30 seconds, and then switch arms. 4. Arnold shoulder press: 60 seconds. Stand with your feet shoulder-width apart and position the dumbbells at your shoulders, with your palms facing your body and your elbows bent. Rotate your palms outward as you push the dumbbells up, and fully extend your arms. Rotate your palms inward as you lower the dumbbells back to the starting position. 5. Asymmetrical push up: 30 seconds + 30 seconds. Start in a push up position, place your left forearm on the mat, with the elbow directly under the shoulder, and start bending your right elbow until your chest is just above the floor. Push back to the starting position, repeat for 30 seconds and then switch sides. 6. Speed bag punches: 45 seconds. Stand up, raise your elbows up to shoulder level, shift your weight to the right leg and rotate your right forearm twice. Switch sides and repeat. 7. Dumbbell thrusters: 45 seconds. Hold a set of dumbbells in front of your shoulders with the palms facing your body. Squat and, as you stand back up, extend your arms above your head. 8. Inchworm: 45 seconds. Keep your legs straight, walk your hands out as far as you can, and then walk back up to the starting position. Finish this upper body and cardio split workout with a quick stretching routine. 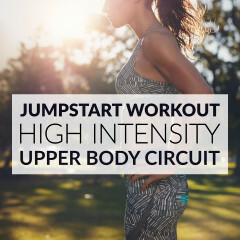 Bump up your EPOC & become a fat-burning machine with this strength & cardio Split Workout!